Liver health : what can be the consequences of an unhealthy diet? In collaboration with Andréanne Martin, dietitian. Healthy diet and habits help maintain the proper functioning of the organs in your body. A poor diet and sedentary lifestyle will impact a person’s overall health and contribute to dysfunction or deterioration of vital organs, including the liver. And your liver is one of the most important organs your body relies on to the balance of biochemical and enzymatic reactions. It produces bile that allows the small intestine to better digest and absorb fat as well as certain vitamins. 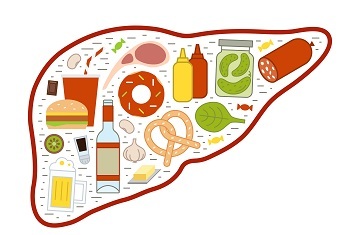 Liver enzymes break down the proteins in foods to degrade them into amino acids and allow them to be absorbed, which will be re-assembled once in the bloodstream. These new amino acid combinations will make it possible, for example, to obtain transport proteins (hemoglobin, etc. ), immunoglobulins (antibodies) or neurotransmitters (serotonin, dopamine, etc. ), all essential elements for better health. The liver stores the carbohydrates (sugars) consumed in the form of glycogen that will be released when necessary to maintain adequate blood sugar or to have extra energy during a more intense and long-lasting physical activity. Vitamins A, D, E, K and B12 are stored in the liver. Some of them have surprising antioxidant powers and are necessary for the synthesis of neurotransmitters involved in optimal mental health. In the light of the information mentioned above, it is obvious that everything should be put in place, as far as possible, to limit or avoid liver damage, since it could compromise certain fundamental functions. One of the 500 functions of the liver is the degradation of alcohol. If too much alcohol is consumed, the liver devotes a large part of its energy in the elimination of toxins. In the long run, excessive alcohol consumption will lead to the destruction of its cells, accumulation of fat (fatty liver), inflammation (alcoholic hepatitis) or even the appearance of cancer. It is recommended that a maximum of one consumption at a time for women and two drinks for men at the same time, a few times a week and not every day. Remember that even though red wine contains polyphenols and some rosé wines contain fewer sugars and calories, no alcohol is more nutritious than another. It’s the quantity and not the type of alcohol that matters. A consumption equals 12 oz. (341 ml) beer, 5 oz. (142 ml) wine and 1.5 oz. (43 ml) of spirits. Excessive consumption of sugar or fat overloads the liver. This often causes a large accumulation of fat within it and predisposes the person to the metabolic syndrome that involves high cholesterol, a sugar level above the norms, a risk of cirrhosis of the liver and even cancer. The consumption of processed foods is associated with excessive intake of fat and sugar daily. It may be best to avoid products that list sugar in the first position in the list of a product’s ingredients. In addition, the fats used are often part of the saturated fat family, and have a negative impact on overall health. They are identified as “hydrogenated fats”, “shortening”, “palm oil”, etc. Seeking foods with unsaturated-fats may have a more positive impact on overall health. People spend less and less time cooking and fast food restaurants offer options that are often much richer in carbohydrates and fat than what is prepared at home for the same menu. Again, the repetition of restaurant meals, without necessarily considering the quality or type of ingredients or foods used, will go beyond the level of macronutrients, which can affect liver health. Considering all the roles attributed to the liver in maintaining overall health, it is easy to identify the consequences of harmful dietary choices. The proteins will not be totally digested. Cells will not have access to all the amino acids they need to make chemical messengers that induce cascades of biochemical reactions in the body. For example, when the brain sends a message to contract the arm to perform a movement, this messenger will be synthesized at the level of brain cells. The neurons and the ingredients for making this neurotransmitter are among others, the amino acids from the complete digestion of proteins. Other chemical messengers (neurotransmitters), made in the same way, are also involved in depression, stress management, well-being, alertness, sleep, etc. These elements demonstrate the importance of a healthy liver and functional enzymes. The liver also acts as a filter for harmful substances absorbed or produced internally. Inadequate dietary habits could compromise this self-cleaning function, promoting the accumulation of unwanted substances inside the body. When one changes their lifestyle, the effects can often appear quickly: increased-energy level, sleep quality and ability to concentrate. In a second step, we can see some markers change positively such as sugar levels, cholesterol levels, blood pressure, weight, waist circumference and blood supply of micronutrients. It is sometimes harder to see the internal damage when you feed less well, since the impacts appear insidiously. But we know, considering the different functions of each organ, that we are made of what we eat. So be sure to choose the right fuel for your body, your most valuable tool to accomplish all the challenges that inspire you. Praesent dapibus fringilla Curabitur sem, commodo nunc id Sed elit.